Forward-facing, full-figure portrait of a young woman seated in an armchair. She has a distant and contemplative expression, with her eyes gazing downward to the left and her head also tilted slightly in that direction. She has dark hair neatly parted down the centre and tied away from the face and wears a floor-length black dress, which reveals the shoulders, has short sleeves trimmed with black lace, and a small posy of red flowers fixed to the bodice. Seated well back and resting both hands on her red upholstered chair, she has allowed a letter to fall from her hand into her lap. The background is dark and without detail contrasting with her pale skin. Wandering Thoughts about 1854 John Everett Millais 1829-1896 Oil on canvas After his youthful alliance with the Pre-Raphaelites, Millais began to find his own way. One of his strengths was in his ability to evoke a feeling of deep melancholy seen in works like Autumn Leaves. This small work offers us a moment in a narrative we cannot decipher with certainty. 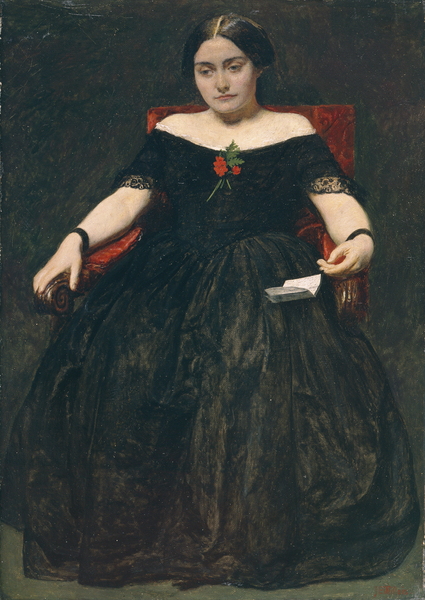 The black dress and the letter suggest bereavement. He looked again at the techniques of the old masters scorned by the Pre-Raphaelite Brotherhood. Here, he has used black, white and red to give the picture strong contrasts and drama.